If you want to get ripped fast you need the best lean muscle building foods that pack on lean muscle and keep you satisfied for longer. Top 8 best lean muscle building super foods to get ripped fast. Is salmon the best muscle food to get lean? 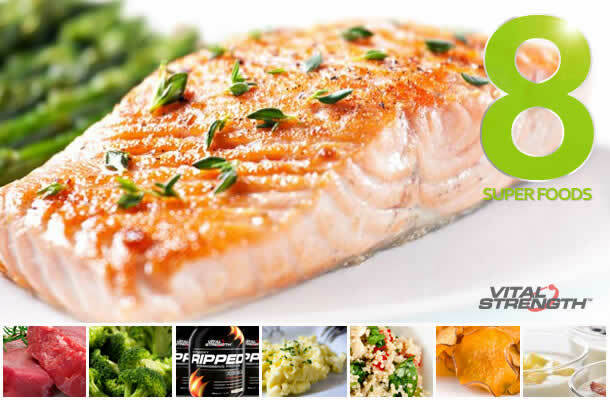 Fish in general is one of the best lean muscle super foods, widely used for bodybuilding and salmon is the king! Salmon can help you build lean muscle and burn fat, just by eating it. Salmon is leaner than other lean muscle protein foods that have comparable amounts of dietary fat, such as beef, chicken and pork. Omega-3’s may also help to decrease muscle breakdown after your workout while increasing the anabolic capacity of amino acids and improving muscle recovery. Lean Muscle Food Tip: Most guys and bodybuilders wanting to build lean muscle and get ripped, look and feel leaner when they eat fish, so add some salmon to your eggs in the morning or try incorporating some grilled salmon with a salad or green vegetables. Are eggs the best muscle food to get lean? Eggs are a great lean muscle food for anyone serious about building ripped lean muscle and are staple for any bodybuilding diet. 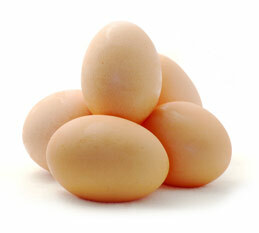 Egg whites are low in fat, and high in protein making them one of the best muscle foods to get lean. While some people argue that egg yolks are high in cholesterol, more recently eggs have been shown to actually lower the harmful cholesterol in your body and raise the good, making them a great lean muscle food in moderation. In addition to muscle building protein, egg yolks also contain vitamin B12 that can assist fat breakdown and muscle energy. Eggs are also one of the best muscle foods to get lean as they help to keep you full longer, resulting in stabilised blood sugar and stopping you from consuming unnecessary extra calories throughout the day. Lean Muscle Food Tip: For an ideal mix of lean muscle protein and healthy fats try using a ratio of three egg whites and one egg yolk in your next omelette or scrambled egg mix. Also keep an eye out for frozen egg whites next time you are at your supermarket. Is Vitalstrength Ripped Protein Powder the best muscle food to get lean? 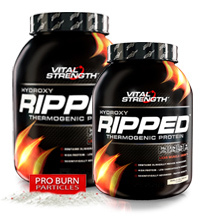 Vitalstrength Ripped Protein Powder is the best lean muscle food to help you get ripped and cut fast. Vitalstrength Ripped formula contains whey proteins that are considered by many athletes, bodybuilders and fitness experts as the best muscle food to get lean. Whey proteins help to prolong fat metabolism and promote lean muscle growth post exercise making it a key muscle super food. Vitalstrength Ripped also contains clinical fat burners including L-Carnitine and African Mango Extract, plus muscle building BCAAs- Leucine, Iso-Leucine and Valine to blast fat and build ripped, lean muscle. Lean Muscle Food Tip: To maximise its benefits as a lean muscle food Vitaltrength Ripped is best taken post workout or in between meals, mixed with skim milk or water. It can also be added to smoothies, yoghurt and desserts. Is sweet potato the best muscle food to get lean? Sweet potatoes are considered by many athletes and anyone serious about bodybuilding to be one of the best muscle foods to get lean and build ripped muscle. While sweet potatoes are high in carbohydrates they are great carb option for building lean muscle as they are a complex carbohydrate that helps to stabilise your glucose levels, which is key for burning fat and maintaining lean muscle mass. Including sweet potatoes in your lean muscle bodybuilding diet also helps to supply your body with the carbohydrate energy it needs to repair muscle and train hard. While you should have a “carbohydrate strategy” it is important to balance your macronutrients and also train your body to become used to eating carbohydrates, without making it store fat. Lean Muscle Food Tip: Sweet potatoes are tasty, versatile and easy to prepare, making them the ideal lean muscle food. Short of time? Wash, prick with a fork, wrap in a paper towel and put in the microwave for a few minutes. Is lean red meat the best muscle food to get lean? Lean red meat is one of the best muscle foods to get lean muscle as it is packed with protein that is rich in essential amino acids and is also a major source of vitamin B’s, phosphorous, iron, zinc, and creatine all of which are important for lean muscle growth, athletic performance and bodybuilding. Beef also contains some saturated fat, which can support healthy testosterone levels, and monounsaturated fat, for heart heath. Unlike plant-based protein sources, beef is power packed with humanlike muscle proteins including skeletal muscle proteins like myosin, actin, and troponins, as well as collagen and other connective tissue proteins that help to build lean muscle. Beef is also one of most concentrated food sources of creatine, which is used as an energy reserve in muscle cells which comes into play during high intensity muscle contractions in the gym. Lean Muscle Food Tip: For maximum lean muscle growth with minimum calories, look for extra-lean meat cuts. Is quinoa the best muscle food to get lean? 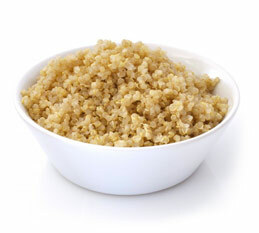 Quinoa (pronounced Kin Whar) is the South American “king of grains” that is a protein packed source of complex carbohydrates that is digested slowly and has a low glycemic index, helping you to avoid blood-sugar highs and lows and support lean muscle growth. Quinoa, which contains all 8 of the essential amino acids has higher protein content than wheat, barley, or other major grains and is fast becoming a staple in athletes and bodybuilders diets as one of the best muscle foods to get lean. Its high fiber content keeps you full for longer plus the naturally occurring amino acids help to build lean muscle and assist muscle recovery. One cup of cooked quinoa contains around 9 grams of protein compared to a cup of cooked rice that only contains around 4g of protein. Lean Muscle Food Tip: Quinoa tastes great, is easy to cook and is a great lean muscle food to eat post workout served with meat and green veges. To make it quick get yourself a rice cooker, follow the instructions for perfect quinoa every time. Are green veggies the best muscle food to get lean? Green veges such as spinach, broccoli and asparagus have long been considered a “super food” because of the many health benefits they offer. Research now shows that green veges are also a muscle super food and are one of the best lean muscle foods to help you build strong ripped muscle. Green vegetables play a key role in building lean muscle as they contain many vitamins and minerals plus l-glutamine and amino acids that are important for efficient muscle contractions and other vital processes in the body. Green veges can help you lose fat by lifting your metabolism and improving your digestion to leave you full and satisfied while also improving your overall energy levels by boosting energy usage inside of muscle cells, so you’ll burn fat and build lean muscle. Lean Muscle Food Tip: To maximize nutritional value and benefits as a lean muscle food, many people recommended that you eat your green veges raw or steam-cook them. Is low fat greek yoghurt the best muscle food to get lean? Greek yoghurt is one of the best lean muscle foods that contain an ideal combination of protein and carbohydrates for workout recovery and lean muscle growth. Greek yogurt has more than double the amount of protein compared to regular yoghurt, is packed with calcium, is low in sugar, and is also high in B vitamins, including B12 that can help to lift your metabolism and assist lean muscle function. Low fat greek yoghurt is a great post-workout lean muscle food as it helps to build lean muscle by keeping muscles fuelled with amino acids and is one of the only foods that contains conjugated linoleic acid (CLA), a specialised fat shown in some studies to lower body fat. Lean Muscle Food Tip: Choose plain greek yoghurt as a lean muscle food rather than the high sugar flavoured versions and also try mixing with a scoop of Vitalstrength Hydroxy Ripped to further increase the protein hit.